A straightforward multi at the parish church of St Ive in South East Cornwall. Please DO NOT attempt this cache at night. 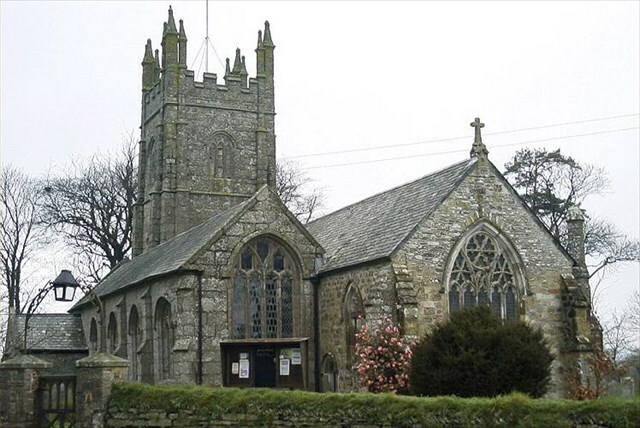 The church is dedictaed to St Ivo who was an early Cornish Saint and hermit who is also known as St Ive. Complete 14th century chancel executed by Exeter masons and possibly the work of William Joy. Exeter and Wells Cathedral dominated international architecture in the early 14th century. The chancel at St Ive has a fine five light Geometric window with integral ogee headed statue niches on each side. The suite of chancel fittings is completed by a piscina and triple sedilia. The rector in 1314-49 was Bernard de Castro, a personal friend of Bishop Grandisson of Exeter. Some geometrical glass apparently survives in north transept. A fine alabaster fragment of St Christopher may be Nottingham or Stafford work of c.1400s. South aisle pillars are Cornish standard but more elaborated carved than usual with cresting and rope work, reminiscent of St Kew. Good wagon roofs throughout with roof bosses and carved angels. Pulpit still has its tester and though dated 1700 may incorporate some 16th century bench ends. Royal coat of arms of 1660 with Victorian colouring. Statue to Emily Hobhouse, the campaigner, who first drew attention to the concentration camps in South Africa during the Boer War. She was born in the vicarage here. The church is generally open from 10 am to 4 pm on most days and is worth a wander around - unfortunately dogs are not allowed in the church grounds even on leads. Parking for one car is available at N 50 28.793 W 004 23.000 but if this is occupied then plenty of space is available in the large lay by at N 50°28.732 W 004 23.200 about 300 metres down the road. Please take care - this is a busy road all of the time and traffic moves very quickly through here. The headline coordinates take you to the entrance porch of the church. Above the front entrance is a rather fine sundial with a coiled serpent and a tudor rose carved on it. The date on this sundial is ABCD. There is room to park a car at the GZ whilst you retrieve the cache. There are good views of the church tower from th GZ. The cache is a camo'd plastic tube 10 cms long and 3 cms in diameter. You may need tweezers to extract the log and please Bring Your Own Pen. Onfr bs zrgny tngr cbfg haqre n syng fgbar.